Spacecraft Showcase - Check out our first Designs! In Infinite Fleet, you take command of a fleet of gigantic space ships. Each of these ships has a general purpose, but you can modify them them to suit particular roles in your overall strategy. Within those ships, are the squads. Squads are much more suited to a particular goal, but you may also upgrade and strengthen them over time. 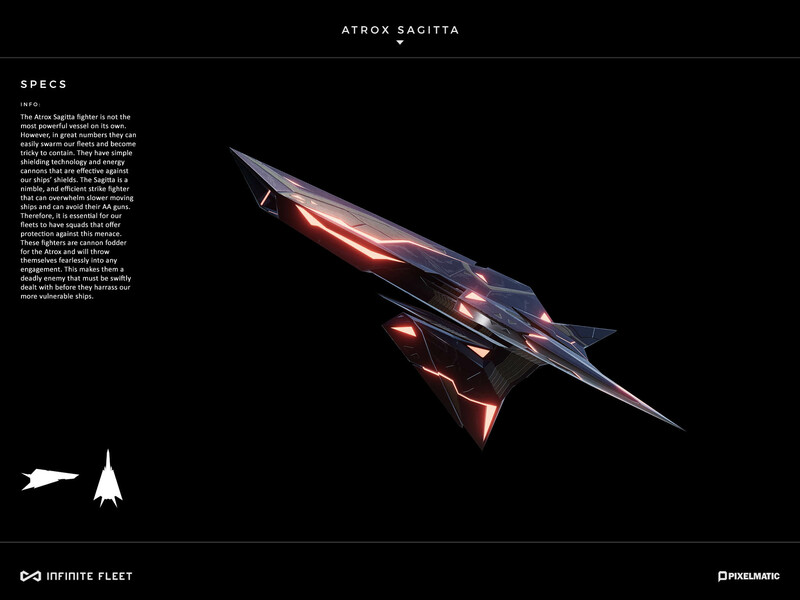 So let us introduce you to a couple of ships, and an Atrox fighter! 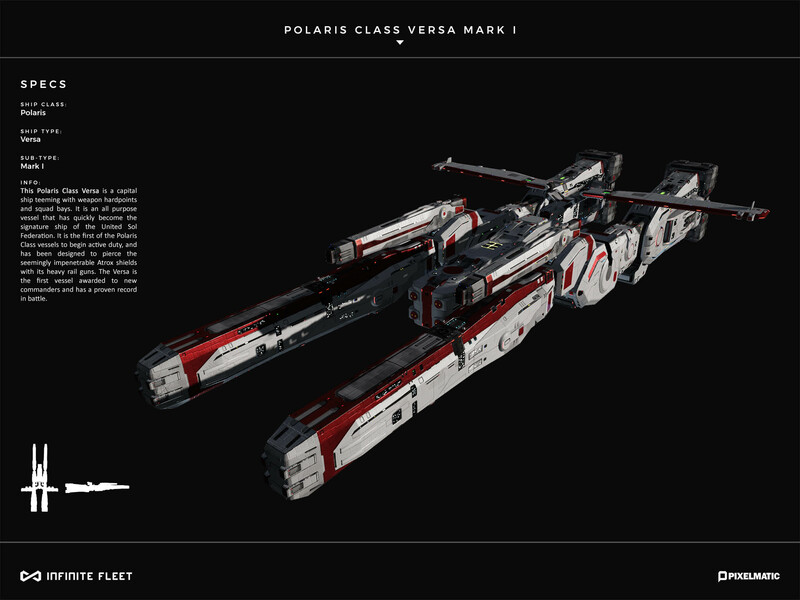 The Versa, as the name suggests, is a total all round war machine. This will be the first ship provided to you when you join the fleet. It is loaded with a wide arsenal of weaponry including substitutable heavy and light weapons hardpoints and also an array of AA guns to mow down enemies at close proximity. The Versa also comes with a repertoire of squad bays giving it the versatility for many different types of engagement. Its shielding is mid-strength, as is its hull. Therefore, it cannot hold its own against aggressive punishment but it is fast enough to dip in and out of engagements with enemy while other ships take the brunt of incoming fire. 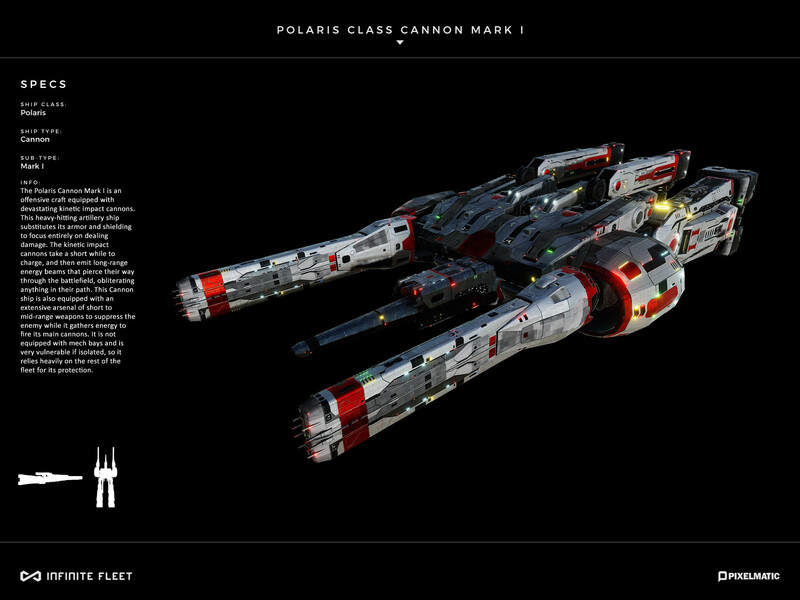 The Cannon substitutes speed and endurance with a spectacularly powerful pair of Kinetic Impulse Cannons. This is an artillery ship that has long range cannons, heavy and light weapons hardpoints and AA guns for its last line of defence. The Cannon can wreak havoc from afar, but it is slow and vulnerable and thus must be protected at all costs. If the enemy breaks through the line and hits the Cannon ship, it will easily be destroyed. This ship does not have any squad bays and focuses entirely on attack. Its Kinetic Impulse Cannons fire in a predetermined line of fire, which means the commander must consider the flight path of the enemy, but they can also be used to stop enemies in their tracks and them to take a particular path. The Sagitta is a pest. On its own, this nimble little strike fighter doesn’t cause much of a threat, but in a swarm they can be devastating, like locusts picking off our ships one by one. The Sagitta is excellent at disabling a ships shields if it can get close enough. Ships AA guns are not fast enough to engage them, though they can suppress them somewhat. However, they are vulnerable in dogfights so the key to their defeat is in containing them away from our ships. It is always wise to keep a squad or two back to defend ships against these maleficent fighters.